Swiftly following the Brancywych is the final model from the start collecting box I picked up in February. Thanks to the airbrush I was able to get him fully painted up in about 3 days… which was a bit of a surprise! 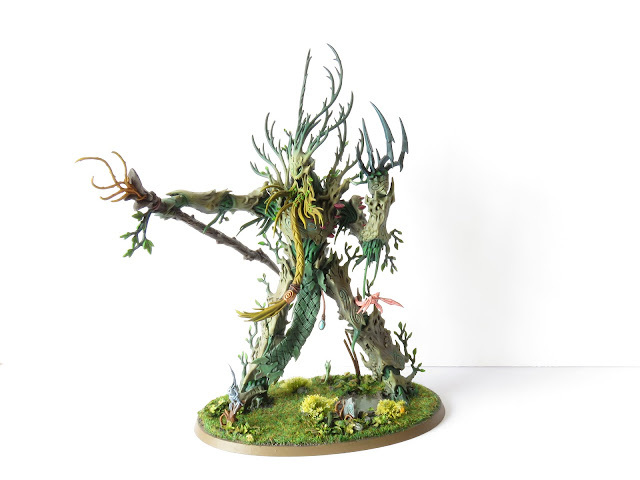 I’m happy with how he has come out although I am slightly questioning the general colour scheme I’ve chosen for my Sylvaneth force. It's just a little flat. I'm not going to do anything about it at this point... I’ll ponder what I could add and then come back at a later date if the mood takes me. So, let's go through the stages and paints used. First of all, I glued the model together using as little superglue as possible so that once he had been primed I could break him back down into sub-assemblies (for the rest of the painting process). As usual, I primed through the airbrush using black Vallejo primer and then grey Vallejo as a zenithal highlight from above. 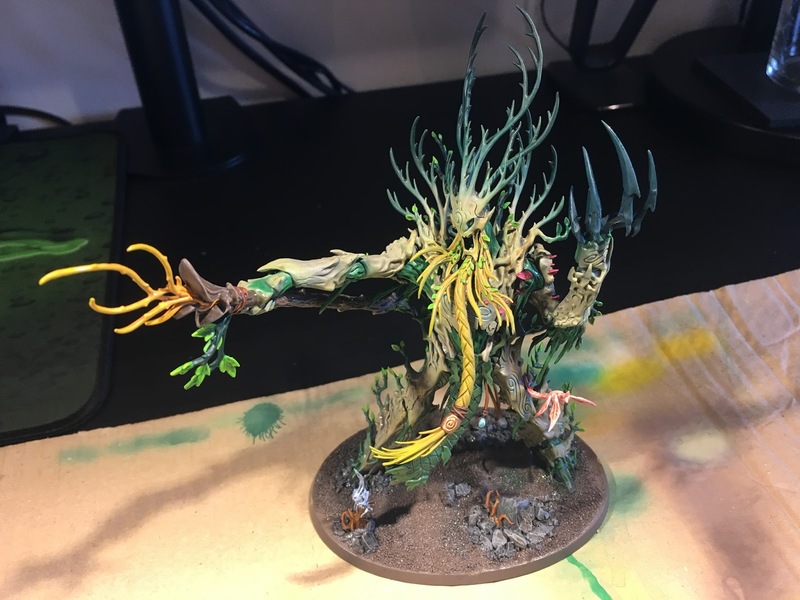 The main bark ‘armour’ received coats of Dryad Bark, Gorthor Brown, Baneblade Brown, Ushabti Bone and Screaming Skull in ever decreasing amounts. The lighter green on the bark was applied using a mix of Ogryn Camo and Screaming Skull. Once the main bark had been painted, I broke the model down into various sub-assemblies. I then airbrushed the bark ‘flesh’ and ends of the branches with Caliban Green. The yellow areas were painted with Averland Sunset and highlighted with Flash Gitz Yellow. 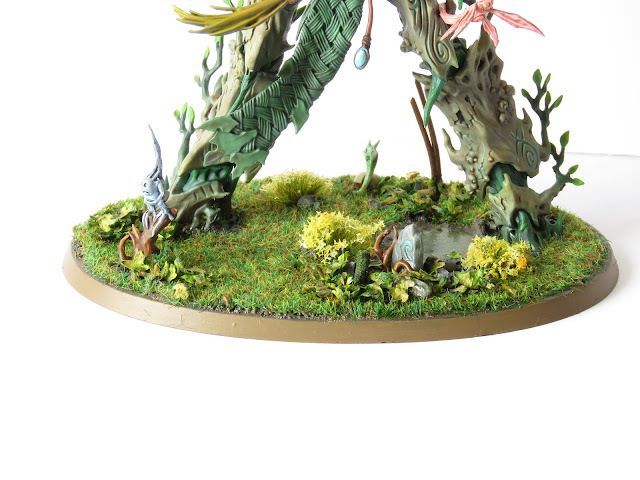 The leaves were painted with Moot green and edge highlighted with Flash Gitz Yellow. I usually apply a glaze of Lamenters Yellow glaze to the leaves but I forgot this step. Oops. The talons on his left hand were painted with Dark Reaper and Thunderhawk Blue. 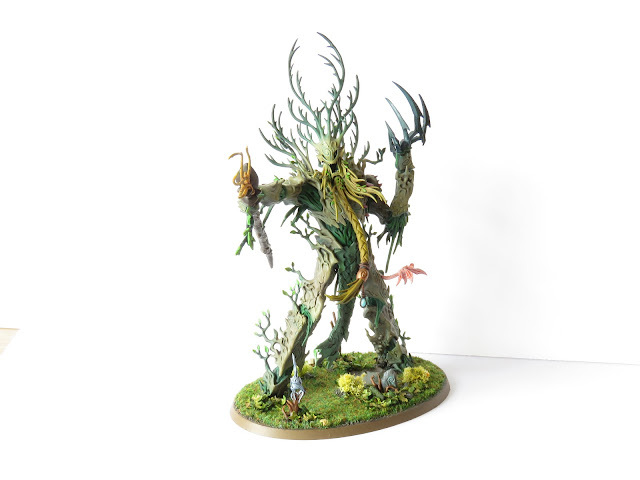 The staff was painted with Dryad Bark and dry brushed with Sylvaneth Bark. His runes were painted with a slightly watered down Baharroth Blue. After all the base colours and highlights had been applied, I applied a couple of coats of gloss varnish and then, once that had dried, I mixed up a wash of 1 part Army Painter Soft Tone and 1 part Army Painter matte wash medium. This applied the subtle shading I wanted and the matte medium also removed the shiny gloss effect. Once the model was completed, I turned my attention to the base. As with all big models, this chap had quite a large base! I textured the base with a mix of small stones, sand and some detail pieces from the Sylvaneth kit. I then painted these using the same base colours used on my other Sylvaneth models. I also used the same static grass, spring leaves and daffodils that you can see on my other Sylvaneth. What I did differently on this model, however, was to build a shallow pool area for which I could test pouring some clear resin. 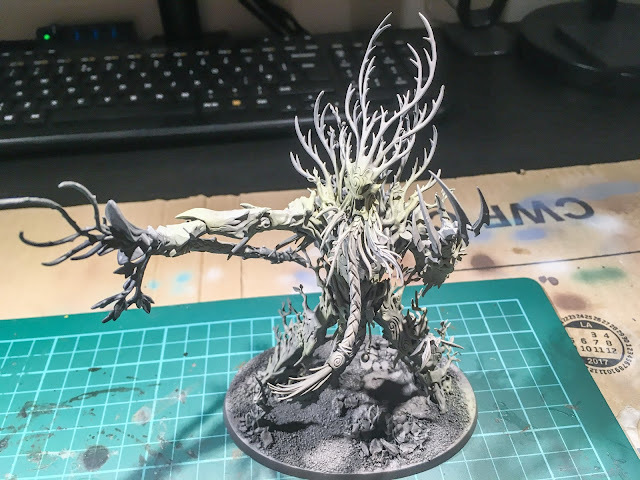 I will cover this technique in a future post, but I'm pleased to say that it all worked nicely and looks pretty awesome!